The school photographer hated me because I refused to smile. He even made a note of it in my photo-packet, in case my parents got upset. They weren't though, once I explained that I wanted a "serious" picture, like the ones taken of them in the old country. 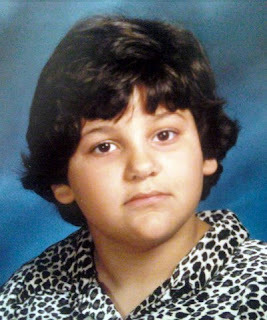 But really, my logic was: 'I'll be more handsome with a straight face and a leopard print collared shirt'. I was teased around this age for my thick Persian accent, but more so for my androgyny. I didn't have a word for it then, but "Are you a boy or a girl?" was something I heard often. Being the only nerdy, gay child of immigrant parents in a (trashy) white town, our family felt jealousy and resentment. All I ever wanted was to make the family proud, but I knew that my existence alone painted a target on their backs. My parents used my good grades to excuse my gender-bending, and quickly changed the topic to that whenever the subject of my tomboy-ness came up. My friends said "We always knew," my mom said "I don't want you to be denied ANY opportunity in life," and my dad said "Whatever makes you happy." Personally, I never accepted the classical notions of "boys" and "girls" that they fed us in school, and neither did my peers, all of whom grew to love me. I pursued my goals and never apologized for being born a queer. If any teens or pre-teens are reading this, just focus on your own well-being. If you work at being a trustworthy, loving, and genuine person, those who really matter will recognize your worth, and who'll seek to earn your companionship. 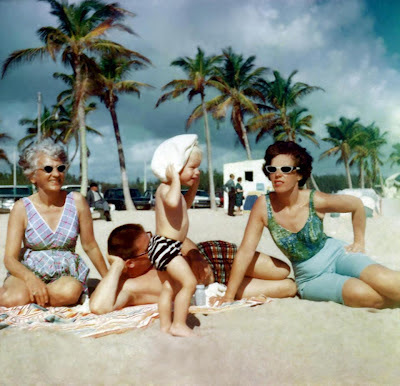 Julie Andrews in "The Sound Of Music"
I don't remember this New Year's Day picture at a Fort Lauderdale beach, as I was still an infant. But as you can see, the cat was clearly already out of the bag! It would remain out of the bag til this very day, and there wasn't a thing I or anyone else could do about it. I think my mom's expression show's a bit of shock, while my grandma is full of GLEE! My dad, as usual, was in his own world. I was very different right from the get go. I was the toe-headed blond, while my sister and brother (8 and 10 years older than me) were both darker and brunettes. As the story is told, my mother asked my sister and brother: "Do you want a baby or a puppy?" "Puppy!!!" they both exclaimed. "Too late," my mother replied. Later in life, I would go on to create videos with fabulous divas like Madonna, Cher, Ann-Margret, and The Go-Go's. And now they call me "Dan-O-Rama." Click here - My First Gay Crush Blog"